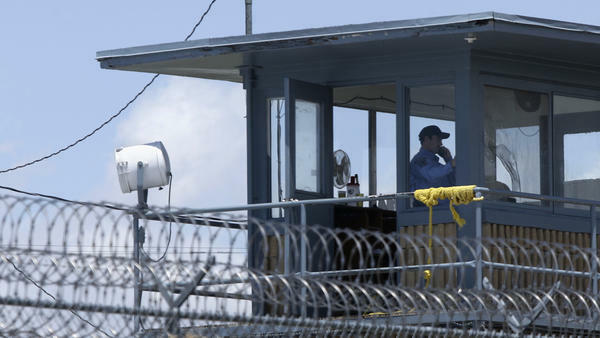 A guard stands watch in a tower at the Arkansas Department of Corrections Tucker Unit near Tucker. With crime numbers, though, you have to look at the bigger context. Last year's increase was geographically uneven. The spikes have been higher in certain big cities, such as Los Angeles, but also, unexpectedly, in small towns and rural areas. In fact, murders were up 17 percent in communities with fewer than 10,000 people. Violent crime went up in all regions, with the exception of the Northeast. But those who think criminality in general is on the rise should keep in mind the fact that property crime is down — burglary by 10 percent, larceny by 3 percent. In the past, broad increases in crime rates were driven by big factors such as demographic changes and — to a lesser degree — economic conditions, and sustained increases in violent crime were usually accompanied by simultaneous growth in property crime. There's no sign of that in last year's statistics. It's also important to keep things in a historical context. A jump of 1.7 percent in violent crime is a lot less worrisome when you remember that crime rates have been bumping along at near-record lows — America's violent crime rate is still roughly half what it was two decades ago. But people live in the now, especially when it comes to their perception of crime. If you live in Chicago and feel unsafe, it's cold comfort to be reminded that twice as many people were killed in the city in 1992. The police chief of Huntington Beach, Calif., tells NPR that people are used to the new normal of lower crime rates, something he believes was achieved with the "Broken Windows" approach to policing. "[W]e evolved to that because that's what society wanted. They didn't want to deal with all those crimes anymore," Chief Robert Handy says. And this is where even a small increase in crime rates quickly gets political. Handy and some other police chiefs in California are unhappy with a 2014 state ballot measure that reduced penalties for small-scale crimes. A year into that change, police point to localized spikes in crime as an argument against the reform. In Los Angeles County, the Association of Deputy District Attorneys posted an opinion piece earlier this month titled, "Is Prison Overcrowding Actually a Bad Thing?" The recent bipartisan movement to shrink America's prison population is keenly aware that any increase in the national crime rate — or even the impression of an increase — could threaten their efforts. A newly formed group of police executives was quite deliberate when it named itself "Law Enforcement Leaders To Reduce Crime & Incarceration." The assumption is that there won't be political support for reducing the latter without continuing reductions in the former. But given how low crime rates already are, that might be a tall order. Revamping the justice system will be messy, and even the reformers admit in private that it might be hard to avoid localized, passing spikes in the crime rate and that even a number as small as 1.7 percent could endanger their mission to cut a much larger figure: the 2.2 million people currently behind bars.